Provide comfort for the family of Jake Hopps with a meaningful gesture of sympathy. AKWESASNE – Jake James “Sak” Hopps, 71 of Island Road, passed away Wednesday afternoon, March 20, 2019 at Cornwall Community Hospital after a brief illness. Jake was born February 18, 1948 on Cornwall Island, the son of the late Phillip and Bertha (White) Hopps. He attended schools on Cornwall Island before going to school in Cornwall. He entered the US Marine Corps on June 5, 1969, serving his country during the Vietnam War. He was honorably discharged as a Lance Corporal on November 17, 1970. He married his companion of over 40 years, Donna Francis on January 19, 2001 at St. Regis Catholic Church with Rev. George Belgarde, SJ, officiating. She predeceased him on July 11, 2015. Jake was a bridge painter for Local 401 and worked in both Akwesasne and Rochester. For most of his working career he was a carpenter and electrician for Mohawk Council of Akwesasne. 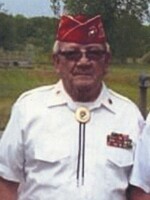 He was a member of the Andrew W. Cook American Legion Post 1479 and the Marine Corp League Detatchment #566. He enjoyed woodworking, fixing things and could often be found tinkering on projects in his “Man Cave”. As a young man, he was a goalie for the Thunderbirds lacrosse team. Jake is survived by his sons, Jamie and Natalie Francis of Cornwall and Roland Francis of Cornwall Island; his grandchildren, Daylon, Montana, Jaylee, Kyler, Destiny, Ocean, and Ashton; a great granddaughter, Thea Donna Rose; his stepdaughter, Crystal Francis; his sisters, Mary and Jerry Cook of Akwesasne; and Rebecca White of Cornwall Island; many nieces, nephews, cousins; and a special friend, Anna Reynolds. In addition to his parents and wife, he was predeceased by his brother, David Hopps on November 30, 2014 and a foster brother, Frank Square on September 3, 1988. Friends may call Monday 2-4 and 7-9 at the Donaldson Funeral Home, Massena where funeral services will be held on Tuesday 2:00 PM with Rev. Jerome Pastores, officiating. To send flowers in memory of Jake James "Sak" Hopps, please visit our Heartfelt Sympathies Store. Provide comfort for the family of Jake James "Sak" Hopps by sending flowers. I'm so sorry to hear the loss of Mr.James.It is not easy to loss some one we dearly love in death. But today we all have to face that enemy.But Our heavenly father gives us a hope in his word the bible," the resurrection hope". Bible shows that God has both the "ABILITY" and the "DESIRE"to bring back the dead. He keeps in his limitless memory a detailed record of each person he will resurrect by means of his almighty power. ("Understanding the Almighty is beyond our reach,He is great in power,And he never violates his justice and abundant righteousness-(Job 37:23) So we can have our full trust in him that he will fulfill his word about the "RESURRECTION". ("And I have hope toward God, which hope these men also look forward to, that there is going to be a resurrection of both the righteous and the unrighteous"-Acts 24:15) May these words help you to have a hope and comfort in this difficult time. Steve Doc O'Brien I served with the Marines as a Navy Corpsman (Doc) in Vietnam. When I joined the Akwesasne Marine Corps League and met Jake. We both served in a Marine Cap Team about 30 miles from each other. We shared experiences and became friends, close as only combat brothers can be. My condolences to all his family and friends. I will remember him always. My prayers are with you always.